Sakai Guides and DocumentationAssessments and Grading AssessmentsHow do I download Tests & Quizzes submissions for grading offline? 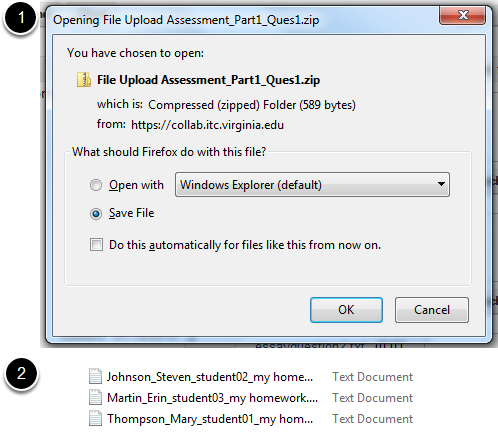 You can download assessment responses for grading offline, including bulk downloading submissions to a File Upload question so you can easily access them from a single folder on your computer. How do I give same score (e.g. 0) to all students with no submission to an assessment? How do I grade Tests & Quizzes submissions by student? How do I grade Tests & Quizzes submissions by question? Export scores and students' responses as an Excel spreadsheet. You can export an Excel spreadsheet that contains all the students' responses and scores for an assessment, as well as any comments you entered for students on the Total Scores screen. On the following screen, click Export. Click the second Export button on the screen to export the file. Depending on your browser settings, you may be asked to save or open the file. Once downloaded, you can open the file in a spreadsheet program, such as Excel. The resulting spreadsheet lists the students' names, user names, number of the assessment submission (if multiple submissions were allowed), final scores, any Grader's comments you entered for students in the Total Scores screen, and the students' responses to each question. Note: Certain question types, such as File Upload questions and Audio Recording questions, which need to be graded within the Tests & Quizzes screen, will not be able to display answers in the spreadsheet. Download all File Upload submissions. Click on the Questions link in the assessment menu to access the list of questions. Select the File Upload question. From the list of question numbers, select the File Upload question. Each question is listed as the letter Q with the question number (e.g. Q1, Q2). Save and open the ZIP file. Based on your internet browser settings, you may be prompted to save the file. Save it to your local disk. Unzip the resulting zip file. You can see all the students' submissions in one folder. 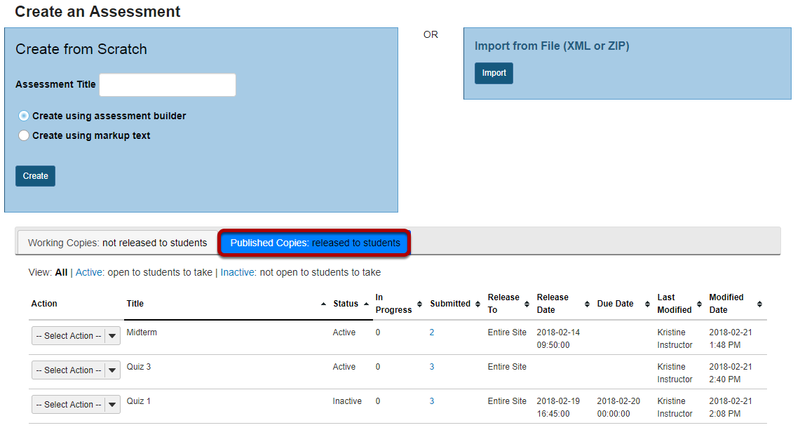 Each submission will be labeled with the student's name, followed by an underscore, then the student's user name, another underscore, and the file name. Prev: How do I grade assessment submissions by question? Next: How do I give the same score (e.g. 0) to all students with no submission for an assessment?